Buenos Aires (AFP) – Business-friendly conservative Mauricio Macri was sworn in as Argentina’s new president Thursday, turning the page on 12 years under left-wing power couple Nestor and Cristina Kirchner. 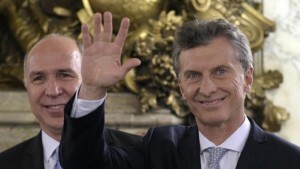 Kirchner boycotted the ceremony after a tiff over protocol escalated into a messy court battle, so Macri received the presidential sash from incoming Senate speaker Federico Pinedo. Macri, 56, laid out an agenda for change in his inaugural address.